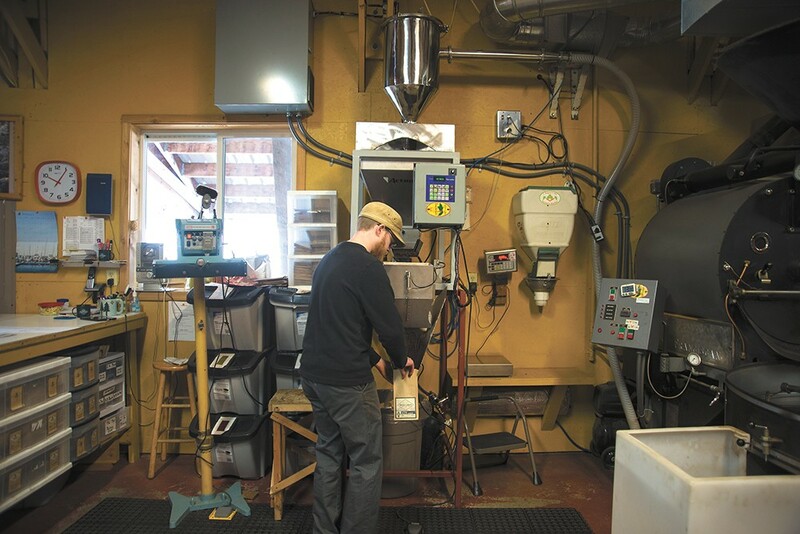 Landgrove Coffee roaster Jon Binninger holds coffee beans that haven't been roasted. At Landgrove Coffee, a roasting company in Troy, Idaho, the counters in a small kitchen are cluttered with different methods for brewing the perfect cup: pour-over drippers, French presses, and a refurbished espresso machine. Roastery owner Jon Binninger pours water from an electric kettle over coffee grounds piled in a copper dripper. His current favorite, a fruit-flavored, lightly roasted bean from Ethiopia, filters into a glass carafe. Though he started a career in coffee by opening a café, Binninger most enjoys working behind the scenes. At Landgrove, started in 1998 with wife Hannah, he's several steps away from the moment a barista hands a drink across the bar, but he's equally interested in the reaction to that first sip. "You can take great coffee and make a horrible drink," Binninger says. "To make a great drink, you have to have great coffee and great preparation and everything." While baristas impress customers with hand-poured art, independent roasters operate in the background. Though not entirely helpless at ensuring the experience goes as planned, they depend greatly on all the other variables coming together to show their coffee or espresso in its best light. Because some drinks depend on so many other variables, like properly steamed milk, coffee roasters take a lot of care to work with the right people who won't be lackadaisical about their vulnerability. "The preparation of these drinks is just so huge," Binninger says. "Finding those outlets where they really care what they're doing — that's key to my success." The Binningers have found such success in numerous kindred spirits, including those running Roost Coffee & Market in Pullman. Mackenzie Yates opened the small shop inside the BellTower event center planning to feature Northwest roasters. Landgrove quickly became a staple in the two-year-old shop, as a very local outfit that's shown itself amenable to trying new things. Chris Malberg fills a bag with freshly roasted beans at Landgrove Coffee roasters in Troy, Idaho. Conversation with Yates and Jordan Meligan, coffee manager at Roost, can quickly turn into a game of naming roasters and geographical regions, and the flavors they've come to associate with each. They've sampled a wide variety of beans, and relish the opportunity they've had with some suppliers to make suggestions that eventually play a part in the roaster's business. "I feel like Roost, as a company, we kind of push our roasters," Meligan says. Not that they're restrictive or critical, he adds, but they offer ideas and ask for new options. With Landgrove, that included ordering a special batch of beans from Guatemala from a boutique green-coffee distributor. Roost also is working on special coffee blends with Landgrove and a Portland-area roaster, Dapper & Wise. The Pullman shop seeks out relationships with roasters who have impressive reputations, and in turn are sought out by others. At last count, Roost had five different roasters available — more than Yates anticipated at the beginning. The shop features a different roaster each month along with other standbys, like Landgrove and Evans Brothers Coffee Roasters, a Sandpoint company that's received much acclaim since opening in 2009. "The hard part with featuring people is you become attached to them," Yates says. The model Roost follows is known as a multi-roaster café. It's a trend that's been good for companies specializing in roasting small batches of premium beans, says Rick Evans of Evans Brothers. "Multi-roaster cafés opens up the door for us," he says. Roost is the first café in the Palouse area to go that route, while Spokane has several, including Revel 77 and Coeur Coffeehouse. But like Landgrove, Evans Brothers recognizes that the impression they make on coffee drinkers depends on how coffee shops approach their beans. Yates says the first question she and Meligan field from roasters pertains to how Roost will use their coffee: Slow brewing? Espresso? Standard drip? It may simply factor into which beans they recommend. Or if they want to partner at all. 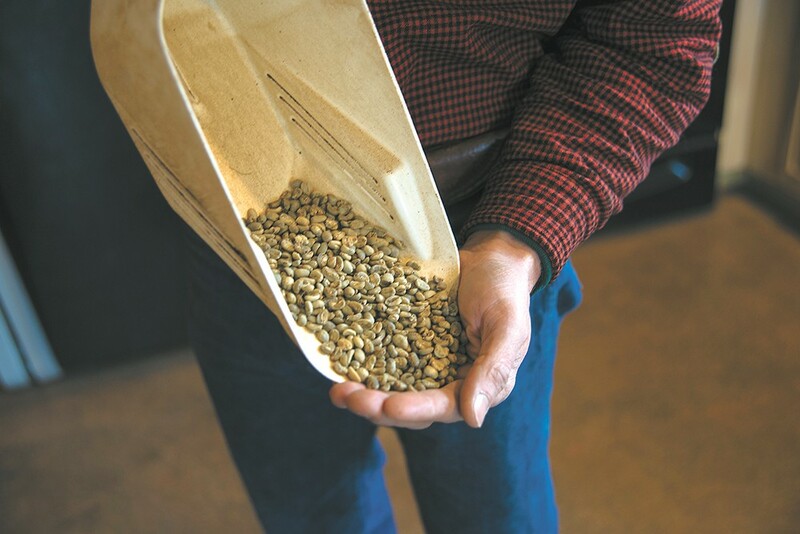 "We're kind of only as good as the coffee the people get to taste that our wholesale customers are serving," Evans says, adding that they set standards for aspects like how long coffee should sit out and how finely the beans are ground. "We shy away from partnerships where they're not putting a priority on those standards. We want quality," he continues. "The type of equipment is a factor. We're not really looking for somebody that's just trying to do it on the cheap." Some roasters go as far as requiring training in technique, as well as origin, so that coffee shops can do justice to the precise sourcing roasters are doing. With more and more coffee roasters, standing out can depend on those kinds of details.